Feature • Expanded metal premise free flow of light, heat, sound and air. • Effective alternative cost. • Available in a variety of mesh configurations including diamond, square, round, hexagonalplus architectural and decorative patterns • It is easily fabricated, finished, installed and formed. Specification Material Aluminum Surface treatment hot-dip galvanizing, electric galvanizing, powder coated, PVC coated, anti-rust paint, polished, anodized, etc. Expanded mesh types Mesh type and direction, limitless choice of colours and lighting designs can be combined with ease to ensure an aesthetic finish. • Mesh size and alignement may present a different appearance to the ceiling. Such openings in the ceiling in projects with low ceiling height, ensure that air behind the ceiling becomes part of the general air circulation. • Changes in the direction of the meshe cause the formation of different angles of light and fields of vision which, when combined with appropriate lighting systems, create a varitey of aesthetically pleasing shadow effects.Raised expanded metal is also known as standard expanded metal. Raised expanded metal is made by shearing and stretching the metal sheet with a set of die on a press, creating diamond shaped openings. The solid intersections of two strands are called bonds that lie on top of each other to form a raised effect. This adds additional strength and rigidity to the expanded metal, also provides directional skid-resistance surface. No material is lost in the manufacturing process, not like the perforated metal production, so it is a green engineered alternative in many projects. 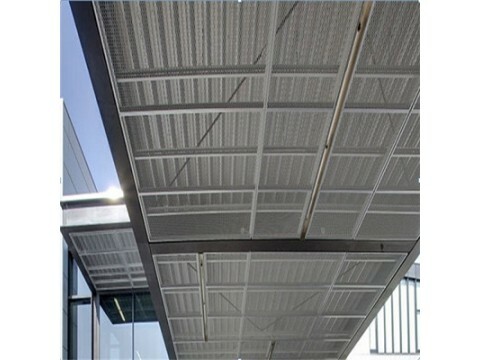 It provides a screening effect, allowing light, sound, air and water to pass through. A variety of patterns, sizes and colors available, ideal for decorative meshes. Flattened expanded metal is expanded in its normal way, which is the same as raised expanded metal. An additional process is by passing raised expanded metal through a cold rolled reducing mill and a leveler, leaving a flat also smooth surface similar to perforated metal. The rolling process elongates about 5% the length of the sheet while the width remains the same. Flattened expanded metal possesses many properties, making it a very versatile product suitable for applications across many industries, such as commercial, automobile and agricultural. Smooth surface won't hurt anyone. Low cost and free maintenance. Plastic film then pallet or according to the customer's requirments. 15days for 1X20ft container,20days for 1X40HQ container. Over 20 years' experience in wire mesh industry and exporting more than 70 counries. Dongjie Wire Mesh is the real professional manufacturer. The quality of product is the key of the survival of enterprise . Dongjie Wire Mesh is a ISO9001:2008 certificated manufacturer. We'll exactly control each producing process to reduce cost for our customers. After clients receiving the quotation, we 'll show you the rational priceand the difference between our products and other suppliers' products. We'll make a produciton plan before producinig, and the sales will regularly inform the production schedule and process to the customer. English is the basic language and other language also can be understood. All customer's e-mail will replied within 2 hours at working hours and must be replied within 12 hours at non-working hours. Personalized, professional service: We can provide different programs according to customer's requirement, thus make customers choose the best and appropriste one.